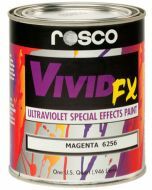 This is a test kit which contains a single one ounce container for each of the 13 colors in the Rosco VividFX Fluorescent lineup. Great for small scale mock-ups or just to experiment with colors! DilutionVividFX should be used straight out of the can. It can be diluted with water if necessary, however, this may reduce the hiding power of the paint as well as the "glow" under UV lights. ApplicationStir contents well before use. Apply by brush, roller or spray gun. Apply in thin uniform coats, using a goad quality brush or roller. Use overlapping strokes, keeping a wet edge. NOTESFluorescent pigments will degrade from prolonged exposure to ultraviolet light. Avoid direct sunlight where possible.